Apple’s on a bit of a shopping spree, it seems. After having last week confirmed its acquisition of business location data firm Locationary, the company has also snapped up HopStop, the maker of cross-platform apps that provide public transit directions. Apple confirmed the acquisition to AllThingsD late Friday. As with Locationary, the reason behind Apple’s acquisition of HopStop is pretty clear: The transition to iOS’s built-in mapping systems has been a rough one, and that’s only been compounded by the release of a native Google Maps app for iOS. Apple’s service often looks lackluster next to that of its rival; public transit is a particular sore spot, since Apple has been relegated to offloading that feature to third-party apps, including both Google Maps and HopStop itself. And while there are many features whose absence your average user would be likely to overlook, maps have become crucial enough to the smartphone experience that the lack of public transit directions, coupled with iOS’s other mapping issues, has actually reached the mainstream. Apple certainly couldn’t afford to cede public transit directions forever, no matter how good its maps were. The free, ad-supported HopStop is one of the more well-regarded and extensive transit apps; it says the app supports public transportation in more than 600 cities around the world, which gives Apple a pretty sizeable leg up in rolling out its own public transit directions. 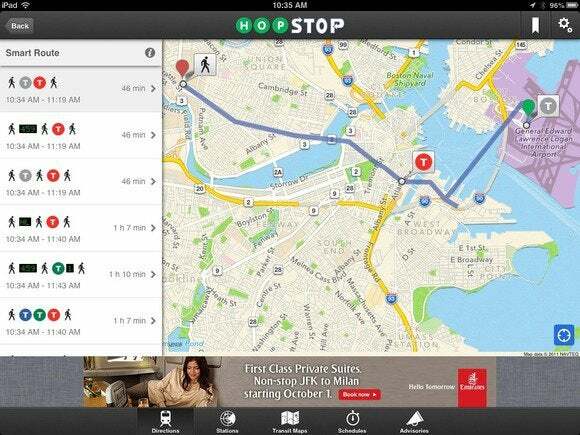 HopStop also includes cycling, taxi, and walking directions, each of which could help bolster Apple’s offering. However, given that iOS 7 is due in a couple months and Apple has only now acquired HopStop, it’s unlikely that built-in public transit directions will surface this fall. While there’s no sure thing in technology—especially when it comes to Apple—I’d bank on a revamped public transportation directions system coming next year in iOS 8. This deal isn’t without its casualties, either. Coincident to Apple’s acquisition of the company, HopStop also quietly discontinued support for its app on the Windows Phone platform and withdrew it from that platform’s store. At present, the app remains available for Android devices.